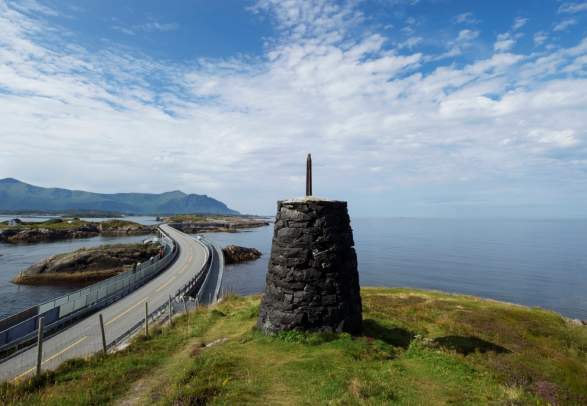 Feel the butterflies in your stomach as you navigate the hairpin bends of Trollstigen mountain road, drive the Atlantic Road in a shower of sea spray, or balance across the Romsdalseggen ridge. The two coastal towns Molde and Kristiansund are strategically located close to the Norwegian Scenic Routes Geiranger-Trollstigen and Atlanterhavsvegen. Molde faces south towards the Romsdalsfjord and has a view of the 222 mountain peaks in the Molde Panorama. Kristiansund is one of Norway’s most distinctive towns, with its post-war architecture on four different islands. Both Molde and Kristiansund has a rich cultural life, including the oldest opera in Norway in Kristiansund and a renowned annual jazz festival in Molde. Mountain hikes in stunning surroundings, skiing, sea eagle safaris, mountain biking, or deep-sea fishing – in the Northwest, you get to pick and choose between the best of what Norwegian nature has to offer. The varied terrain means that you can go for a range of hikes, from family-friendly walks along narrow coastal paths to guided mountain tours to some of the steepest peaks in Norway. If you’re not the hiking type, you can enjoy tranquil summer days on one of the many mountain farms, or go fishing for cod with meat as white as snow. Whether you have a passion for long steep hills or want to take it nice and slow, the Northwest provides cycling possibilities for everyone. A natural choice is the Norwegian Scenic Routes Geiranger-Trollstigen and Atlanterhavsvegen. Hike the Romsdalseggen ridge in Åndalsnes, try the Fjord route north of Kristiansund, or visit the beautiful valley Innerdalen and explore Trollheimen. The varied landscape of the Northwest provides optimal cycling possibilities for everyone who plans a holiday on two wheels. The Northwest is known as an excellent area for ski touring, with its high mountains, amazing views of the fjords, fresh snow, and long descents. For many travellers, deep fjords and magnificent mountains are good grounds to visit the Northwest. Those who enjoy fishing have yet another reason: The fjords are teeming with fish! In the Northwest, you can choose between a number of wildlife safaris and see eagles and other birds, seals, and reindeer. The region also offers good hunting grounds. Get moving in the Northwest! If you want an active holiday, you should check out our sports activities. Find more activities and attractions in the Northwest. Don't miss our latest articles! Here are our latest stories, and a quick look at what's going on. Many travelers say that the most interesting trips are those where you come in close contact with the communities you visit. One way of achieving this is to use public transportation. We have made it easy for you to use public transportation while you are a tourist in our region. We have packaged the most popular itineraries in the area and made it easy for you to book the trip with one ticket that covers the entire journey. Enjoy your trip! Make your holiday special by choosing the right accommodation. Many places in the Northwest include experiences like local food, cultural events, and interesting architecture. Choose from a variety of hotels, many of them highly rated by TripAdvisor. If you want to rent a cabin or a holiday home, the possibilities are many. And if you prefer to sleep in a tent, a motor home or a camping cabin, you can spend the night wherever you please. For a more homely holiday, stay in an apartment or holiday house. And those who want something totally different can try living on a farm, rent a lodge, or get close to coastal culture in a fisherman’s cabin. The Northwest offer a number of good restaurants and cafes, as well as many interesting local food producers. We have gathered some our best experiences. All offers are close to our most popular destinations, such as Molde, Kristiansund, and the Norwegian Scenic Routes Atlanterhavsvegen and Geiranger-Trollstigen. Just click on the listings below to order.